Ukrainian President Petro Poroshenko and Azerbaijani President Ilham Aliyev are holding negotiations in Baku on Thursday morning. The meeting is taking place as part of the Ukrainian leader's official visit to Azerbaijan, an Interfax-Ukraine correspondent has reported. Upon completion of their bilateral meeting, Poroshenko and Aliyev will preside over a session of the Council of the Presidents of Ukraine and Azerbaijan, after which several bilateral documents are expected to be signed. They include the session's protocol, a document on interaction between the two countries' customs services to crack down on customs violations during air cargo transportation, as well as a 2016-2020 program for the Ukrainian and Azerbaijani Culture Ministries' cooperation in culture and art. 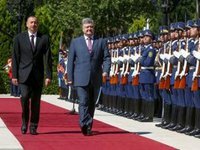 Poroshenko and Aliyev will make statements to the press after the documents are signed. During his visit, the Ukrainian president also plans to hold separate meetings with the Azerbaijani prime minister and the speaker of the Milli Mejlis, Azerbaijan's parliament. Poroshenko is also expected to meet with Azerbaijan's Ukrainian community.